AddFreeStats Analytic offers to webmaster a powerful tool for analyzing and tracking the traffic on their PrestaShop stores. The tool is well designed with the aim of splitting data and giving the most accurate results on the traffic on the site. So if you are looking for a free premium tool to help you monitor and grow your online store, AddFreeStats is the perfect choice. AddFreeStats is also very easy to integrate into your PrestaShop store. Here is a five minute installation guide on how to integrate AddFreeStats onto your PrestaShop store. 1)	First you should sign up for a free account on Addfreestats.com. Signing up is very simple and only takes two minutes. You will get a unique tracking code for your PrestaShop store. 2)	Next you need to log into your PrestaShop account and then click on “Modules” on the upper navigation bar. 3)	Next you need to find the appropriate module to help us install the code on the store. Use the search box to find “Content Box” module. 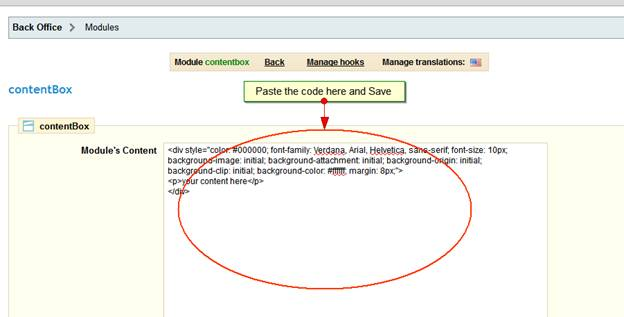 The “Content Box” module is used to place any code or text anywhere on your store. 4)	Next you need to click on the module and install it. After the installation is confirmed, you should now head over to the module pane and click on “Configure”. 5)	After clicking on configure, a new page opens up where you are required to enter anything whether HTML or just word. Now paste the code obtained from your AddFreeStats account as HTML. 6)	Finish the installation by clicking on save. 7)	Now to display the AddFreeStats on your store, drag the module to any location that you wish to place it. Your AddFreeStats analytics tool is now well installed and is running. To access the statistics you can either click on the AddFreeStats button on your store or log into your AddFreeStats account. When you log into your AddFreeStats account, you will discover many other useful services provided by AddFreeStats.